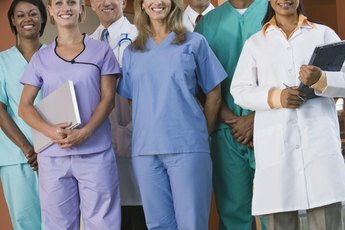 Nursing students work supervised hospital shifts called "clinicals." Every registered nursing program has its own mix of required classes. 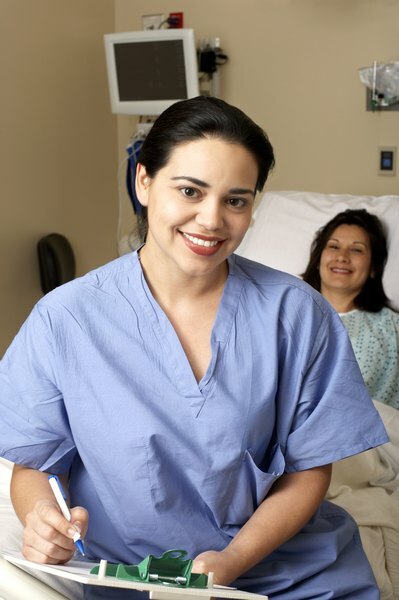 There are two educational routes to take to become an RN, or registered nurse: through a two-year associate degree, or ADN, or a four-year bachelor of science in nursing degree, or BSN. Both routes require similar classes for the first two years, but the last two years of the BSN program will include studies of ethics, leadership and management. General college studies required for nearly every college degree include classes like English, mathematics, social studies and a foreign language. Both ADN and BSN programs include these. Some nursing schools won't accept you into the nursing program until all your prerequisite studies are complete. If you've taken these classes in the past, either for another degree or before you dropped out of college for what seemed like a good reason at the time, talk to your adviser about whether you need to repeat them. If your grades were good, you might not have to repeat them. Science courses are a big part of nursing curricula, from anatomy and physiology to chemistry and microbiology. Pharmacology classes and "soft" sciences such as psychology, nutrition, human development and sociology will generally be on the curriculum list as well, along with advanced mathematics such as statistics. Introduction classes to nursing teach the history of nursing, nursing theory, the importance of cultural differences, how to formulate nursing care plans and the pathophysiology of disease. 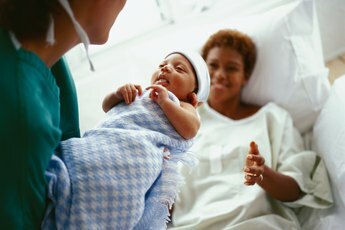 Fundamental nursing classes will generally also cover pediatrics, obstetrics and mental health, as well as general medical and surgical issues. You may do some "dummy" nursing on mannequins in nursing classes, including learning how to give bed baths, giving injections or inserting Foley catheters on specially-designed mannequins that can't protest if you need two or three tries to get it right. The most exciting classes in nursing school are clinical sessions -- shifts spent working in a hospital with real patients under the watchful eye of your nursing instructor. Schools typically have two six-hour clinical sessions per week for each course, for six to 12 weeks, depending on the course, according to "Getting the Most From Nursing School: A Guide to Becoming a Nurse." You rotate through different parts of the hospital, including maternity, pediatrics surgery and mental health. Normally you will be assigned one or possibly two patients per day. 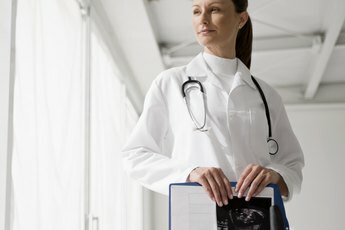 ChooseNursing.com: What Types of Classes Will I Have to Take to Become a Nurse? How Can I Obtain a Health-Care Administrator License?